The gastrointestinal tract may be affected by a diverse spectrum of inflammatory and neoplastic disorders, many of which pose problems for practicing surgical pathologists on a daily basis. Pathologists' understanding of these diseases continues to evolve rapidly. The topics in this issue of Surgical Pathology Clinics address a wide range of neoplasms and present ancillary techniques that play an increasingly important role in diagnostic pathology and include prognostic and predictive markers that have become a routine part of gastrointestinal pathology practice. These expert reviews provide surgical pathologists with critical practical updates on many of these challenging areas, with an emphasis on differential diagnosis and diagnostic pitfalls. Some topics include: Lymphomas of the gastrointestinal tract; Mesenchymal tumors of the gastrointestinal tract other than GIST; Barrett's esophagus: evolving concepts in diagnosis and neoplastic progression; Immunohistochemistry in neoplastic gastrointestinal pathology; HER2 testing in adenocarcinomas of the upper gastrointestinal tract; Pediatric inflammatory gastrointestinal pathology; IgG4-related disorders of the gastrointestinal tract. 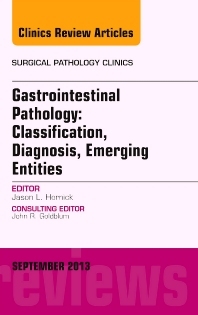 The reader will be interested in cross referencing the first volume on GI pathology presented in this series; its popularity with surgical pathologists has led to this second volume, which covers different topics in GI pathology. Jason Hornick of Brigham and Women's provides his expertise to lead this issue.